The Schwalbe One V-Guard Folding Road Tyre features Schwalbe's V-Guard puncture protection belt. V-Guard is made of a tightly woven and extremely cut-resistant high-tech fibre to provide level 5 protection against punctures, whilst keeping weight down. 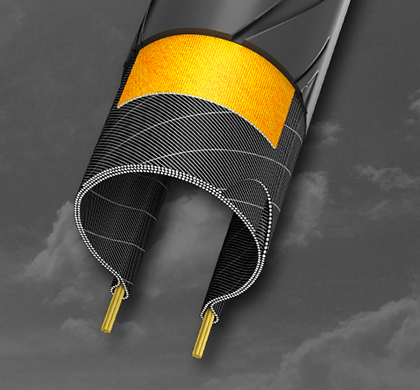 The image above shows the cross section of a V-Guard tyre. The Schwalbe One V-Guard Folding Road Tyre is made from Schwalbe's OneStar triple compound, their most sophisticated compound, with MicroSkin and TL-Easy execution. If you are after high quailty and focused on performance the Schwalbe One V-Guard Folding Road Tyre has everything you need to fly past your personal bests.